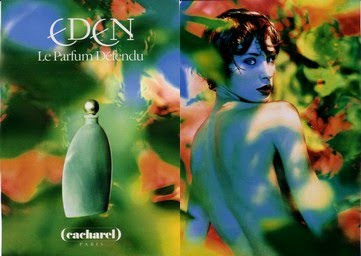 Named after the primeval garden of creation, Eden by parfums Cacharel broke new ground back when it launched (1994) "for the first time ever, encompassing the exhilaration of spring with sensuality", or rather the first fruity-semioriental-aquatic. Yes, I know, it sounds like an improbable combination like bacon ice-cream, but it managed to smell enticing nevertheless. At least it did to me for the first bottle or so. Later I became bored with it and left it aside, never repurchasing. The body lotion I had bulk purchased was very nice and continued to remind me of the scent for a while longer. Imagine the shock and elation it provoked in me when my significant other remembered it when I brought out again a sample of it the other day and casually dabbed my wrists in this succulent fruity number. Memories, like cheap coffee, can come in instant form, after all, it seems! 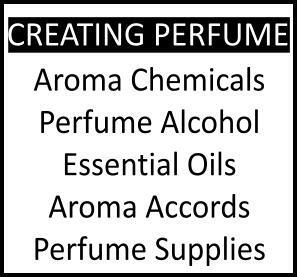 It’s a wonder those catchy innovative ideas like the offerings in the Je me souviens coffret from L’artisan Parfumeur (long discontinued) don’t lure in the buying audiences at a larger scale. The bottle of the scent designed by Annegret Beier is completely friendly, in jade opaline, curved to fit in the palm of your hand, topped with a little green cap in the spray versions or a silvery boule in splash ones . Beautiful in its functionality. When Eden first launched there was a big event that set new standards in the risky and costly mega –launches of perfumes: a whole garden recreated full with tropical and aquatic blooms and semi-clad girls in fountains following the cue of the print advertisements. Unfortunately, Eden didn’t sell that well, which incidentally is one of the reasons why it’s featured here today. In order not to lose such a highly covetable name and concept, Parfums Cacharel went on to create one of the first “flankers” of an original perfume, inaugurating a trend that has progressed so rapidly recently it has resulted in a dizzying exercise against Altzheimer's for us perfume lovers: It’s hard to keep up, I can tell you! 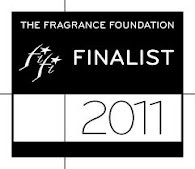 The follow up scent (i.e.the flanker) was Eau d’Eden and it is nice enough to warrant a separate review along the way. Back to the fragrance at hand, Eden, composed by Jean Guichard, opens on tart fruits, namely bergamot, lemon, mandarin, and pineapple alongside melon ( the overuse of Calone was the note du jour of the 90’s after all). A very green smell also makes itself present, mixed with the fruits and the watery notes: it's not a typical fruity, nor is it a typical aquatic nevertheless. In its heart the standard rose-jasmine accord that forms part of most feminine scents is not particularly evident, instead that tree with yellow poms poms, the mimosa, with its sweet sugary, milky smell is the protagonist along with aqueous blossoms like water lily and lotus and a strange anisic component that casts a retro oriental shade on the proceedings. But overall the fruity heart has an element of bubblegum, but the girl popping it is so cute you’d be unfair to chastise her! 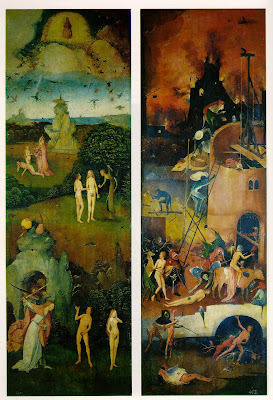 The flowers and fruits are happily Serpent-free in their wholesomeness, pre-lapsarian, the garden of Eden safe from the advances of evil for the time being. Even if this is not your thing, Eden does not disappoint: it's a love-it-or-hate-it kind of fragrance, which means it has something going for it. The good sillage and very good longevity are also pluses in my books. Base: Patchouli, sandalwood, vanilla, musk. Nice review! I am firmly in the love camp, even though I can't usually abide fruity or aquatic scents. Eden *is* sui generis. Yeah, sui generis is a perfect description of its individualism. Fruity and aquatic in a very unusual context. I doubt it would catch on with the people who were either after fruity or after aquatic which explains why it didn't go down so well. Wow, I never thought I'd see this one reviewed again. Every so often I pull it out of the drawer & sniff a dab. So very, very dense and...humid. Eau d'Eden, on the other hand, is one of the few 'aquatics' I've encountered to reproduce a sense of 'watery' rather than screechy. I use my vintage bottle sparingly & have one backup. The Eau was one of Cacheral's best - I can't understand why it was discontinued, but the 'white musk' basenote was high quality & perhaps too expensive. Love the website - it's one of my favorite morning stops! thank you for commenting and for being so kind! Yeah, I thought I might indulge the few who actually love this little gem. It's unjustly ignored. It's quite something. It does cross the boundary between humid (apt term!) and orientalised fruity, a unique combo. 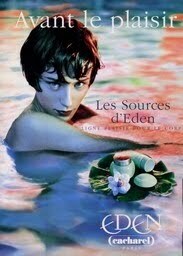 As to Eau d'Eden, will review it soon, it's too good not to indeed. It's a mystery why they ditched it. How interesting. It really sounds a little different, at least from what I have sniffed. I wonder where on earth I would even be able to find it to test? The bottle design is lovely too. I believe online stores still have it. It wouldn't be too difficult. There was a small 30ml bottle spray from what I recall which sounds like the perfect introductory size. It was a very cute little bottle too. I love this perfume ! I have been wearing it since 1996 ! A friend actually gave me my first bottle she was not to fond! However, this perfume is the perfume I always get compliments on. I guess it goes with my body chemistry. Today , I rarely find it in the states ! When I in Europe I always bring back a bottle :)! A co-worker started wearing this about a month ago. Her boyfriend bought her a bottle from Paris. Working in a small office with her, I can only describe the smell as "hideous". Somewhere between "nursing home" and "laundry detergent". I still wear Eden and Anais Anais. They are just "different", unlike another perfumes on the market, this Cacharel fragrances doesn't smell similar to others. I bet it's not popular in the States, because it doesn't have any particular reference and Cacharel isn't big there (M Jacobs has cornered that demographic). Maybe gift her with a basket of small size scented body products next chance you get so she switches? I agree about Eden, it is indeed very "different" (which is the reason why I think it's great). Anais has been copied a lot, surely (I think? ), though it remains better than most of its "sisters". Enjoy!! 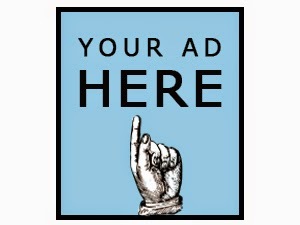 And thanks for commenting here. love everything about eden,the packaging,the wonderful bottle, the ads, but i just cant bear the plastic note,i am wondering if i have made a mental association with the smell and cant shake it. i wish i could train my senses to change that. i have a similar problem with Hermes Jardin sur la nil, cant get past a tomato ketchup association, even though i read the book by chandler burr about its development along side sjps lovely.anyone else have these problems with other perfumes. is it a sort of anosomia?